Jamie’s Insanity Burger, a genuine recipe by Jamie Oliver, is maybe one of the most satisfying and delicious burgers I’ve ever had. I’m no stranger to burgers, and have been making them for many years. What thrilled me most about this recipe was the fresh buns, and the lettuce sauce. It makes this burger ooze and drip with flavor that you just don’t want to miss. Anyone who’s a fan of Jamie Oliver knows his unique and effortless qualities that he harmonizes with food. He takes the simple and makes it dazzling. Burgers are simple. But with a few tweaks and imaginative additions, the simple just got insane! 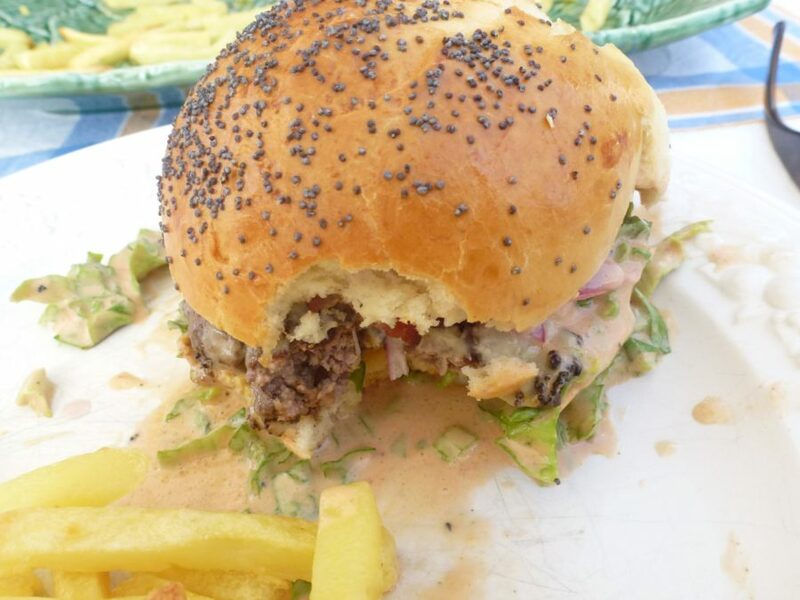 This burger recipe is a reflection and a creation from someone who loves food. The special bits of this recipe are the fresh made buns, the fresh (home ground) meat, the special salad sauce and pickled onion. A flavor packed burger with every corner of flavor matched. It’s an Insanity burger for sure! The entire recipe took me 2 hours, rising time included-time well spent on a sunny Sunday afternoon. Go for it, and enjoy every step of this recipe! 1 TBS yeast soft or 20g. Prepare a pan with a bit of oil in it, be sure it gets nice and hot before you put the meat in. Cook as normal, but once the patty’s been cooked on both sides, paint each side (one at a time) with a thin layer of mustard. Cook again, each side, about 1 minute. in a separate pan, (or same if you desire) cook the bacon and put it aside.